In May we bought a house on 36 acres in northern Vermont in one of the three counties that comprise the Northeast Kingdom. It’s far enough north that it is not touristy Vermont and certainly not second-home-for-New-Yorkers Vermont. We only discovered the area because a good friend moved up here the year before. It’s not the most obvious place to end up when you have the ability to live anywhere (we both work remotely) so I thought I would share the reasons why we chose to make this our home. Jonathan was quite set on having an orchard and doing some small scale agriculture - more than a backyard garden. Out west in Colorado this was not feasible at all. The land is clay, alkaline, and you can only irrigate if you have costly water rights. In Massachusetts water is not an issue but land is expensive. While some parts of Vermont are costly, the Northeast Kingdom is full of incredible homes on large parcels of land at a relatively affordable rate. Our home here cost less than either our house in Colorado or Massachusetts. Vermont has its hippie reputation for a reason. While I occasionally see fields of corn, they aren’t the norm here. People move here to grow local food or to buy local food. In fact, we are number one in the nation for the most local food per capita. Even our tiny town has its own farmer’s market. There is a culture of making and buying locally. Most of the agriculture is organic and sustainable - we don’t live in fear of Dicamba drifting into our yard. And because it’s a great place to live, there are other transplants, which makes it much easier to integrate into the community. The kinds of people who move up here are not career oriented - this is the last place you would come to advance a career unless it’s in forestry. You only move here if you want to have a life, not a job. Everyone I’ve met seems to dabble (or work) in fields I haven’t encountered elsewhere - things like herbalism, foraging, natural dyeing. 4) There aren’t a lot of cultural amenities but there are enough and they are growing. We don’t have any pho or tacos, but we have a few good restaurants around. (Our favorite is Three Ponds.) We’ve got a bakery with croissants. We’ve got a wine and cheese store. And we’re only 10 minutes from St. Johnsbury which is the de facto capital of the Northeast Kingdom. It hosts Catamount Arts, which shows art house films (you can get booze while you watch), concerts, and all sorts of other stuff that warm my millennial pink heart. St. J also has a natural food store, pharmacies, and the regional hospital. We are 10 minutes from 98% of the things that we need. A few new breweries and restaurants are about to open up. The two things on my cultural amenity wish list are good ethnic food and a fabric store. I occasionally day dream about quitting my day job and opening a fabric and yarn store in St. J’s charming Victorian downtown. I should probably also mention that for the athletic minded, there is serious mountain biking at Kingdom Trails and serious skiing at Burke Mountain. The view from our house. When we drove up to this place, I knew that was it. Love at first sight. Can you blame us? So there you have it! Feel free to ask questions if you have any. I could talk about Vermont all day. This is quite a long post, but I wanted to take some time to reflect on things I made in the past year. Many of the things I loved initially didn't end up getting worn as much as things that took some time to grow on me. I've realized that writing reviews of garments before I've actually taken time to live with them may be a bit of a disservice. I will not be writing up clothing as quickly in 2018. When I began to write on all of the sewing that has done this year, I realized it reflected my journey through this year. Our life the last few years has involved lots of change - getting married, I went back to school and changed careers, both of us changed jobs multiple times, and we moved across the country twice. 2017 was the year that has the least change in it since… well, I’m not really sure, maybe 2011? Jonathan and I have both been working the same job all year, we have been living in the same place, and most importantly, we haven’t acquired any new cats. My sewing began a little unplanned and all over the place but became more cohesive and intentional as the year went on. We moved back to Massachusetts in October of 2016 after being in Colorado for two years. In some ways, it felt like coming home, and in others, it did not. Before buying our house, I’d never been to this town that we live in. It’s about 40 minutes from where most of my friends live, which is fine on long summer evenings but feels prohibitively cold and distant in the winters on frozen back roads that may or may not have ice on them. So after taking a break from sewing for a few years, I took it back up. And by ‘a break’ I mean I sewed just a few garments in a year. At some point last February I decided it was time to quit watching Netflix every night, and cut into some fabric, so I downloaded the Colette Neenah dress, pulled out some lovely, thick ponte I’ve had forever, and went to town. Alas, alack, I made a totally dumb beginner move. I used my old body measurements even though I’ve gained some weight the past two years, so it was too tight and horribly unflattering. But I had started sewing. Once back on the sewing train, I decided it was time to sew my second button down. I had finished one Archer shirt with lots of hand-holding from Anna, and bought some lovely mammoth flannel from Fancy Tiger destined to be a second one, but it had been sitting in my closet for a year. The shirt was a real struggle. Despite hand basting and every other method I could think of, I couldn’t sew the front button placket without puckering that thick fabric. Then (thanks again Anna) I tried using spray glue and it worked! I sewed the buttonholes using a friend's vintage Singer buttonholer, which led to buying one myself and I was in business again. It has a lot of imperfections, but it is warm and cozy and I wear it once or twice or three times a week in winter. I had a fairly sizeable (for me) fabric stash at this point so for Lent I gave up buying things (including fabric, but not thread), and decided to sew with what I have. In the end, I think this was a poor decision because most of the fabric in my stash was from my early days of sewing when I didn’t realize that quilting cotton was for quilting and perhaps a little too stiff for most garments. I made an Easter dress out of a vintagey quilting cotton with a McCall's pattern I’ve had forever and neither the fabric or the style are me anymore. Plus the neckline gapes. Then I made the Heidi shirt from Anna and while it was so fun to sew, the quilting cotton was so stiff and thick that I was never really drawn to wearing it. I think it would be lovely in something softer and drapier. The Heidi shirt is pretty awesome, but despite loving this fabric at first, I never wanted to wear it. After realizing I didn't actually want to sew with most of my stash, I gave the majority of the fabric to my friend Ellie who does costumes for the local YMCA productions and never has enough of a budget. I did, however, have some lovely raw linen which ended up becoming my favorite summer shirt of the year - the Collins Top. Unlike the shirts I was about to go on and make, the fact that it's linen meant that it was never in a special pile of delicates waiting to be washed. I felt totally fine wearing it while gardening or hiking or doing anything sweaty. And it's trendy and interesting enough that I also felt pretty cool. I plan on revisiting this pattern multiple times next summer. Lent ended and I discovered Pintuck & Purl! I wanted a drapier sleeveless top, and I bought some Robert Kaufman chambray for a Kalle shirt. The Kalle shirt is awesome! But the embroidered fabric is a very poor choice for someone who owns two cats. It's begun to unravel already and I don't think it will last more than another season. I need to make it again in a sturdier chambray. I loved it so much I made the tunic length version in a beautiful rayon from Blackbird Fabrics. Sadly, something about my wash machine does not agree with rayon. Almost all my rayon items have had holes appear in them despite washing them on delicate in cold water and hanging them to dry. So neither Kalle will end up as staple wardrobe items despite the fact that I love the fit and the fabric. Cats love this shirt but it does not love cats. Sad, tiny holes everywhere. Also, why didn't I iron this for a photo shoot? I also made a Farrow dress that I almost completely forgot about in a lovely linen/cotton blend. It is so nice to wear but probably the most unflattering dress I own. I may end up putting some elastic in the back so that it gives me at least some shape. Note me putting both hands in my pockets and trying to hold the dress close to my body so I have at least some waist definition. The real hole in my wardrobe at this point was sleeveless shirts. So I went looking for something sleeveless, drapey, and easy for summer and found the Lisboa top from Orageuse patterns. I made two versions. I really loved these when I first made them, but as I mentioned, rayon has not been holding up well in my wash machine. These rayons are both a bit more sturdy (red is from Pintuck, yellow from Blackbird) - but the Orageuse directions did not tell me to interface the deep v in the back of the shirts and despite stitching over it multiple times it has begun to fray on both shirts. I also should have serged the facing to the shirt as that has begun to unravel as well. And they are both so very ... floral. Although I never documented them well, I made three pairs of Maritime shorts. Without any alteration it has become my TNT (tried and true) shorts pattern. I prefer them in a stretch denim although the pattern is written for a nonstretch fabric. I plan on making a few pairs next year and fully replace all my poor fitting ready to wear shorts. In July I decided to splurge on some fabric and made the most disappointing dress of the year, the Charlie Caftan. The pattern didn't work on me at all and it is in a wad in my closet, waiting to be reinvented as a woven Summer top as soon as we get near the threat of warmth and sunshine. Such a waste of that gorgeous, gorgeous Nani Iro fabric. After sewing lots of florals that I loved in the fabric store, but didn't actually reflect my personal style, I decided to rethink what I was sewing and what I was actually wearing and from here on out the fabrics are not going to be nearly as exciting. I read the Curated Closet and really narrowed down what things I love to wear. The first make after my bout of self-reflection was the Orageuse Rome shirt and I really love it. I want to make a few more in some sturdier fabrics - this Japanese cotton is a bit delicate so it goes in the delicates pile. I then moved on to the wardrobe workhorse that I've been intimidated by for years - jeans! Despite the fact that my sewing machine wasn't really up to the job, I managed to churn out a pretty good pair thanks to Heather Lou's Sew Your Dream Jeans online class. I love these so much. I got lazy and decided to buy a pair of jeans at the store a few weeks ago, and I never wear them because they are just so uncomfortable and ill-fitting compared to my Gingers, even without any alterations. I'm currently getting ready to sew my second pair and the adjustments I'm making are minimal. High off making a pair of jeans, I decided to tackle my most challenging project ever - an Anorak. I bought the lining expansion and everything. Honestly, I'm not really sure that my sewing skills were up to it. I probably should have sewn an easier jacket before doing this, because I got stumped and frustrated at several points and about half of this very long project was just not fun for me. But I finished it! And then decided to wax it. It is one-third waxed and sitting in my closet waiting for more wax and some good photos. But all of the sewing bits are done, and I'll be very excited to wear this whenever the rainy New England spring arrives. After the length anorak fiasco, I made a quick toaster sweater to get back some of my sewing mojo. While it was an easy sew, I don't love the fit. It feels very loose and linebacker-y for something that is a knit. It's made with a lovely stretch wool that is incredibly warm which is the one thing I really like about it. This phone angle always makes my clothes look more flattering than they actually are. Then, to end it all, my final project for 2017 was another plaid flannel Archer. I need all the thick, mammoth flannel Archers. They are my favorite winter shirts. Although it wasn't exactly feeling like winter in Llano, Texas, where this picture was taken. Not included in this summary are three things I sewed for Jonathan, my first knitted cardigan, and two knit hats. But I will save those for another post. It's interesting to see all these makes in one place because now I can make a few observations about my sewing year. Firstly, everything I sewed after reading the Curated Closet has been a winner! (Except maybe the toaster sweater.) I think that it was incredibly helpful to take a few days and plot out the things I want to wear and the colors and fabrics I go to in my closet. I would really recommend the book to anyone whose sewing projects are languishing unworn in the back of a closet. Secondly, my sewing skills have really improved! I've been sewing for several years, but I've never made this many items in one year - if I include the projects for Jonathan, that is 22 garments. Many things are responsible for this surge in productivity. The biggest one is that I have my own dedicated sewing space, so I can leave projects out and pick them up with no set up time at all. I never have to clean up projects in order to have dinner. I also have a budget for fabric now and can buy the patterns and materials I need right away. And, after several years of sewing, I finally have all the tools I need to make pretty much everything, from applique scissors to a sleeve board. Although we are only a few weeks into 2018, my sewing pace is still going strong, so I have high hopes that I will be a much more skilled seamstress at the end of this year. I've made a resolution to blog at least twice a month this year. It's hard to know what this blog should be. I don't want it to necessarily be a diary of what I made because that is a bit boring. I may add tutorials if I come up with anything useful. But it may just end up being reflections on how wonderful it is to make things and struggle with new skills. Hopefully by the end of 2018 my blog will have sorted it out just as well as my sewing sorted itself out in 2017. Per the recommendation of pretty much everyone on the internet, I decided to get a copy of The Curated Closet by Anuschka Rees. Due to her guidance, I began to document both what I want to wear and what I actually wear. Both my style and my life have changed a lot in the 10 years since I graduated college and I don't think I realized exactly how much until I was scrolling through some old Facebook pictures. 10 years ago I lived in the city, and while I had a job cooking, my life outside of work involved fancy cocktail parties and a fancy church (Church of the Advent - such a beautiful place!) where people liked to wear hats and drink sherry. Apparently, I owned a lot of shiny clothes and was really into selfies. Fast forward a decade and now I work from home, so I only require a casual wardrobe, no office wear. My friends all have children so any parties happen at 4 pm and don't involve any clothes that require dry cleaning. Per the author's advice I began documenting every outfit I wore for two weeks. I haven't made it to two weeks yet, but close enough. Get ready for a series of poorly lit, unflattering photos because this is real life, not shiny blog life. Lisboa top with my fave maritime shorts. While I do like the print, I'm not a fan of cap sleeves. I love these jeans! They are my first pair and have a few issues, like the fly that is way too long, but they are comfy and I've worn them a ton. Also, this picture really embodies everything that I've realized I like in clothes - natural fibers, drapey top and high waisted pants. Rees asks you a series of questions about how you felt about your outfits, which are very helpful, including 'which is your favorite?' For me, the surprising star of this summer was the drapey linen collins top that I made. Unlike my rayon shirts, it never sits in the tiny pile of delicates waiting to be washed with the special snowflakes so it's almost always hanging in my closet. I don't have to worry about sweating in it or the cats ruining it and it makes me feel like I have some sense of design and style and I'm not just a boring person who dresses for comfort above all else. I also love my flannel button down. I like myself in most button downs. And I'm in love with the high-waisted Ginger jeans I just sewed. I'm going to make another pair with the Cone Mills denim I have in my stash before I move on to rigid denim. Rees advises you to make a mood board and/or Pinterest board for those of us who aren't into real life cut and paste. When I look at images I'm drawn to, it's not really surprising that this top is my favorite. I seem to be drawn to either high-waisted rigid jeans with drapey tops, or high-waisted flares with drapey tops. No dresses in sight, just easy separates. If you want to see more, my Pinterest board is here. This is my favorite image, although I don't know what kind of weather calls for thick sweaters and sandals. Anyhow, based on everything that I've learned about what I want to wear and my personal style, I've begun to make my sewing plans for the coming fall/winter seasons and I thought I would do a fashion trend/sewing pattern mash up because I love reading these when other people write them. Obviously it will be all jeans and drapey tops. After I realized that I really loved the style of high-waisted rigid denim, I went looking for a sewing pattern and to my surprise, there aren't any! But I was able to track down a vintage pattern from the 80s which is currently on its way from Canada to me. I'm going to be stylin', yo. As are a lot of people if the comments on my Instagram account are any indication. Everyone wants to bring back the 80's jeans. Although what was it with the 80's and back pocket placement? Did no one realize that it's fairly important? I'm also very much into the Lander pant from True Bias - I love the high waist, the wide leg, and the button fly. So I'm sure I'll be making a pair or two of those once I plough through this vintage denim pattern. I want to make these in denim and also in some rusty orange twill. Another trend that I'm really loving is the drop sleeve. Unlike a traditional sleeve, it is not set in, but rather extended from the main body like a kimono. It has an easiness which is really lovely and casual, although I'm not sure how well it will do under cardigans and sweaters. I should be realistic about the fact that I live in New England. But I'm going to try making at least one before next summer. We'll be visiting Texas in November so I'll have at least one more excuse this year to pull out some summer wear. The Melilot shirt from Deer & Doe meets the criteria of being a lovely button down with a drop sleeve. I may need to hack it a bit to get that giant drapey sleeve. I could also hack my Kalle shirt dress pattern as well, but I want a slightly closer fit in the body. When it comes to long-sleeved shirts, I love oversized sweaters although I don't have the patience to knit them. I haven't found any good sewn patterns for oversized, knit turtlenecks. Does anyone have a recommendation? As far as coats go, I am about halfway through making the Kelly Anorak. 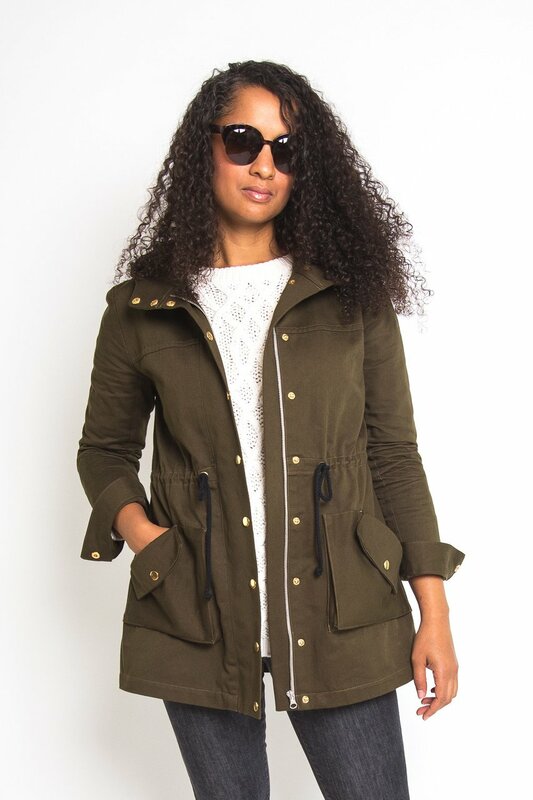 I really need a transitional, rainproof coat with a hood for the fall and spring. I have one coat that meet most of those criteria, but it doesn't have a hood. I can't wait to finish this up! It has been so much fun to sew, especially once I got past my fear of installing heavy duty snaps. Here it's styled with high waisted jeans and boots much like ones I own. Most fun sewing project ever! Some women are into shoes. I am into coats. Unfortunately, one person can only wear so many coats. I don't need a real winter coat. I bought a heavy duty parka last winter. However, I am completely obsessed with this everything about this coat on the left - the perfect length, the vintage snaps, the rusty orange color, the patch pockets! If I were able to find wool resembling this at all, I would buy it immediately. Unfortunately, my internet searches have turned up absolutely nothing when it comes to orange mohair fabric. I did find a BurdaStyle pattern that somewhat matched the shape of the coat so if that magical fabric ever finds me, I will be prepared. So those are the things I most want to sew this winter. Style is tricky. As I get older I find fewer and fewer trends even attractive and I've grown increasingly opinionated. I hate hate hate distressed jeans. I don't think cropped, wide leg pants flatter anyone. Cold shoulder garments just seem impractical and stupid. I don't follow fashion magazines or blogs anymore because they all dress so impractically and for a life that is very far from my own. It was really helpful to actually think about what I like and what I want to wear. I do think I have a distinct style that I'm drawn to, but for the most part, I have not been buying or sewing the things that actually match this style. Shopping at the fabric store can be much like shopping in a department store - the things that catch your eye are necessarily the things you will love on yourself or wear the most. When I walk into Pintuck and Purl I want to buy all the Rifle Paper Co prints even though I don't like florals on myself. So now, thanks to the Curated Closet I have a list of styles I like and a list of things I definitely need to avoid no matter how good they look on other people. Next up, I need to document the things I've made this summer that I've worn to death and those that I've made that haven't seen as much wear. Because I can completely enjoy the process of sewing up a pattern and then not particularly like the way that it looks on me or the way the fabric wears in the wash. But I will save that for another day. If you sew and you are on Instagram, then you surely know that the latest "it" pattern was the Charlie Caftan by Closet Case Patterns. If you don't, well, everyone was sewing it up and posting fabulous pictures and that is why I chose it. I mean, how fun and breezy does that look? Despite never loving bohemian styles on myself, I jumped on the bandwagon because it was hot out and other people were looking so elegant and I wanted to join the Caftan Cult. I decided my birthday was a good excuse to ignore my sewing queue and just do something fun. (I stand by that decision.) Pintuck & Purl had the most beautiful Nani Iro double gauze and I splurged on it, because birthday! Mr. Murray the Cat loves Nani Iro as much as I do. A fabric this special demands a muslin, although I skipped adding the waist ties because that seemed like an unnecessary pain. But that was the real mistake. Untied, it was loose and baggy - it is a caftan after all - but I thought it would be more flattering once I tied it. I thought wrong. A piece of clothing has not made me look this dowdy in a very long time. It IS a caftan. I'm not really sure what I expected - something flattering? More fitted? Mostly, I just wanted to feel cute, and this does not make me feel cute. I got several compliments on it when I first wore it out, but I think that is the fabric making it look better than it is. Because the pictures below tell me that I am not imagining things. My pose in the first picture hides several of the issues. And everything looks better from a distance. Here is how the fit generally looks. And you can't even see the copious shoulder wrinkles. Feeling guilty for subjecting this beautiful fabric to such a fate. It's like a potato sack with a string around it. I'm not sure where I went wrong, or why so many people are having such better outcomes. Maybe because they were expecting a beach cover up and got a beach coverup, but I was hoping for an elegant dress? Clearly, this was not the pattern for me. I adore Closet Case Patterns, and I'll continue to buy most of the things that Heather Lou puts out, but I need to stick with the styles that are more me (like the Kalle shirt dress which I LOVE and need to blog about) and veer away from the ones that are not. I really like the parts of this picture that don't involve the dress. This dress has enough fabric that I should be able to cut a tank top out of it. It's going to be back on the chopping block a.k.a. sewing table soon. I love this Nani Iro way much to let it go unworn. In conclusion, I have to remind myself once again to stay within the parameters of the styles I know that I will wear and love and "to thine own self be true." But let's be realistic, I will still experiment and veer away from that occasionally because what is life without a few risks? All I need is your email address. I promise not to spam you or send you recipes involving spam.